Both Drs. Reverends Lynch attended the World Alliance of Interfaith Clergy (AWAIC) conference that was held at the Wisdom House in Conn. The featured speaker was Arun Ghandhi and the picture shows the Lynches with him. Arun wrote the forward to their book — THE WORD OF THE LIGHT. 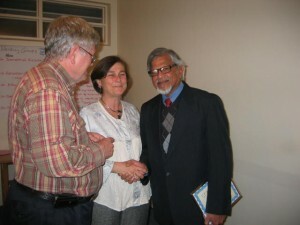 Cynthia Lynch made a presentation on how to prepare grant proposals and Thomas Lynch discussed the Crisis in Religion. Both were also active in the business of AWAIC. Cynthia was chosen as their grants coordinator. Thomas was chosen as the secretary of their Council of Seminaries and serves on the national board.